Stuffed peppers are one of my favourite autumnal dinners. The colours of the peppers remind me of the transition in the leaves at this time of year and I find the meal to be warming and very much a comfort food. So, when Tilda got in touch wanting help to raise awareness for their Mums Helping Mums campaign, I couldn't think of a better meal that this one! For each marked pack, Tilda will provide at least one nutritional meal to new or expectant mothers, wherever they are needed. Although I am not a mother myself, I feel this is such an important cause! Cut the tops off of the peppers and deseed them ready to put the filling in. Dice the left over pepper from the top to pop in the filling. Dice the onion and soften in a pan before adding the garlic granules. Add the mince and cook until brown. Whilst the mince is cooking, dice the tomatoes and mushrooms and add these, with the previously diced pepper into the pan. When softened, add oregano and passata, I tend to buy something like the Sainsbury's basic one, as in fact the runnier consistency works better! Add 250ml of water and the rice and stir well. Bring to the boil and allow to simmer until the mix is no longer watery. By this point, the rice should be cooked. On a baking tray, stuff the peppers with the mixture. 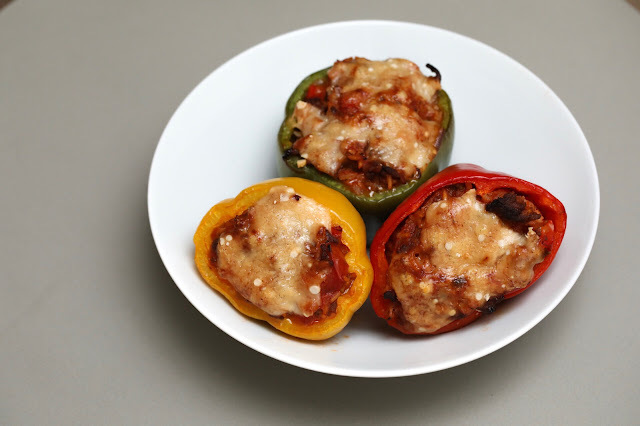 With a peeler, grate strips of parmesan on top of the peppers and pop into the oven for half an our at 180. Once out of the oven, serve as they are or with a side salad! If you give it a go, I would love to know what you think, or if you have any tweaks which are interesting, let me know!